Now just to update you some of the ingredients quantities below are per layer. I'll let you decide how many layers you want to bake, I chose 3. The ingredients list above for the cake itself is done per layer. So I decided to do a 3 layer cake but I know some people like 2 - 4 layers so I thought it was easier to do it per layer. I prefer to mix each layer individually but you could just mix the batter all together and separate into the different layers at the end. I only do this differently as I always tend to get one big layer and two smaller with my poor-proportioning skills. Whisk your eggs and slowly add to the butter & sugar mixture. Sieve and fold your flour into the mixture. Fold in your grated lemon zest. Transfer to your greased/lined baking tin and bake in the oven for 15-18 minutes and golden brown. To test if your cake is ready gently press in the centre of the cake with your finger. If the sponge springs back then it's done. If it stays down then it needs a little longer. Once the cakes have cooled, place the first one on a cake base. Mix the Icing sugar, butter, elderflower liqueur together in a bowl until the desired consistency. I find a fairly soft mixture works best for spreading, if its not quite there you can always add a little more elderflower. Once the buttercream is ready, spread the mixture evenly on your first cake layer on the cake base. Chill in the fridge for around 10 minutes to harden, and ensure structural stability as you stack other layers. Repeat for each layer until your top cake layer has been placed on the top. Mix the icing sugar, lemon juice and butter together in a bowl as for the elderflower buttercream. Place enough boiling water in a frying pan to cover your lemon slices completely. "Fry" your lemon slices in the water for 5 minutes until tender, then remove and drain. Pour 200ml of water into your frying pan. Remove your slices from the pan and place on a wire rack to cool. I find it's helpful to place grease-proof paper under the wire rack for sticky drips which will fall. 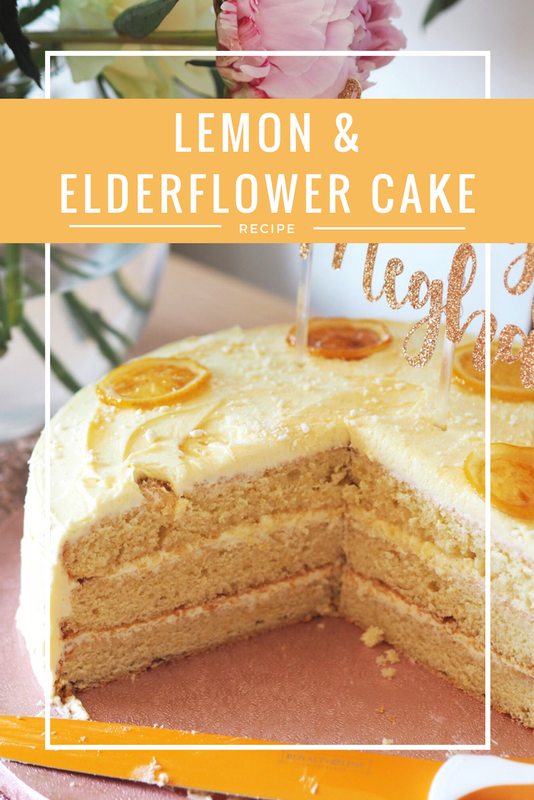 And there you have it one Lemon & Elderflower cake fit for royalty. If you make this cake be sure to tag me in it and let me know if you love it too!